Have you heard? Your About page is prime real estate! Analytics often show the About page as one of the most frequently visited pages on any website. This is true whether you’re a solopreneur or a multinational organization or anything in between. Sadly, About pages are also one of the most neglected pages on a website, which is a shame. People want to know about you and your company, and what you do that can help them. That’s where a great About page comes in. Your About page can accomplish all of that and more! To create an irresistible about page that not only attracts your ideal clients but also helps more of them say “yes!” to working with you, you need three ingredients: content, flow and design. There was a time when your About page was the place to tell your story, i.e. your biography. But now, website visitors are looking for something more than that. This may come as a surprise, but your About page is no longer just about you. What are visitors really looking for when they look at your About page? Reassurance. Reassurance that they’re in the right place, that you understand their pain points, and that you’re the right person to help them. And, reassurance that you’re not a loon. That you’re a real person they can trust. So, you’re still in there, but presented in a different way than a straight bio or resume. The best About pages weave together your background, expertise and values with answers to your potential client’s questions and hesitations. It’s mostly about them, and then how you got to where you are so you can help them. Start with them. Where they are and what they’re struggling with. Then talk about the products, services or solutions you can provide to address these pain points. Tell stories. And then bring in your background and your values. How you can relate to what they’re going through. The goal of an About page is to speak to your ideal clients and to help them identify with you. It builds that know, like and trust factor. By the end of the page they should feel like they know you, and more importantly that you know them. And then it just…ended. The party’s over, no details exchanged, no one asked the other out. Just…nothing. Well, your About page can be like that initial exciting encounter that leads absolutely nowhere, or it can ask your visitor to take another step with you…like a first date. Then who knows where it can go from there? Think of your About page (really, every page of your site) as a step in your potential client’s journey with you. The page should naturally flow to the next step. Don’t simply end your About page and leave your potential client hanging. Give them someplace to go next. Have a call to action. Invite them to take the next step with you. Make it easy for them to say yes, and make it easy for them to click and be taken to that next step. In other words, do the work for them. Make it so simple they don’t have to think about it. If a person gets all the way to the end of your About page, they’re either going to be ready to commit, a little interested, still kicking the tires, or outta there (in which case they weren’t your ideal client and wish them all the best!). Give them the option of reading some of your best blog articles—your cornerstone content—or following you on social media (not sure yet, still kicking the tires). You can accomplish this either through linked text or buttons. Personally, I do both. Add the links where appropriate. And then at the bottom of the page, you could include big, beautiful buttons that can catch the skimmer’s eye—even if they don’t read all the text. Remember the adage, “Neatness counts!” from grammar school? Well, it’s the same with your About page. Style matters. Visuals matter. According to a survey commissioned by Adobe, given 15 minutes to consume content, two-thirds of people would rather read something beautifully designed than something plain. I was working with a client who needed to hire a personal assistant to help with errands. She had it narrowed down to two candidates, and we went online to look at—you guessed it—their About pages. One was…odd, to put it nicely. Hand drawn caricatures, a ‘90s looking typeface and a strange, disjointed layout that provided no substance to what was otherwise a promising-sounding service. It didn’t match her online ad and credentials at all. When we went to the other candidate’s page, it was literally a breath of fresh air. Calming colors, a professional-looking headshot and easy-to-read text all said, “I’m the one!” It was like night and day; and even though the second candidate charged a lot more, her presentation sealed the deal. Avoid a page of just text. Break it up with graphics, testimonials, videos, photos, pull quotes, inspirational quotes…something! No one will read a page of just text. Trust me. No matter how well written it is. It’s OK to show “you” on your About page! Incorporate a professional headshot and, if possible, a more candid photo of you, like a shot of you speaking, spending time with your family, or doing something you love. Let people see you and relate to you. Speak to your brand through colors, typography, flow, and feel. Your About page should fit with your overall brand and style. Finally, work with your website developer to ensure that your About page is mobile friendly. There are a lot of different surveys and predictions out there, but it’s safe to say that well over half (some say more than 70 percent) of your site viewers will be viewing your site on a mobile device, either exclusively or in combination with a tablet and a desktop or laptop. Don’t let a jinky mobile view stop your clients from finding, following, and hiring you! Hands up if you have an About page you need to rework!! Start where you can, and in most cases, that will be at the top—adding in that service piece that speaks to your ideal client. Then revamp the page as you have time and resources, adding photos, perking up the layout and optimizing for mobile viewing. 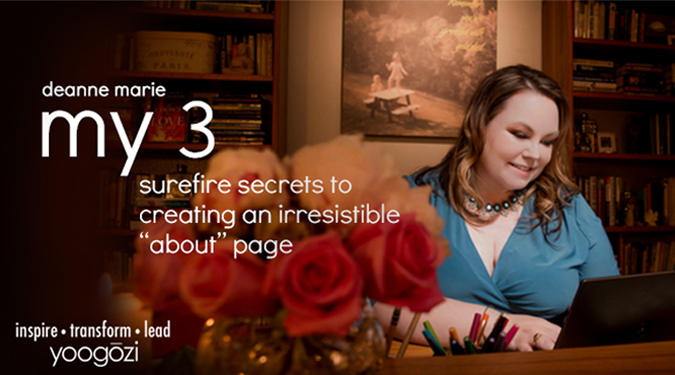 In no time at all, you’ll have an irresistible About page that has fans flocking to you.